Monarch Air Group provides private air charter in Macon, GA. Our clients benefit from top-notch service, unrelenting dedication to safety, wide selection of aircraft, and years of experience in chartering private jets. To obtain a free quote, please use our online quoting tool provided below, or call toll free 1-877-281-3051. Macon is an industrial and commercial city in central Georgia, which is located about 107 miles west of Augusta, 82 miles east of Columbus, and 75 miles south of the state capital of Atlanta. In the 1800s Macon was a trading outpost on the Ocmulgee River and in 1823 was incorporated as a town. Being the county seat of Bibb County, it’s the important industrial and commercial center of Georgia. Macon has prospered aviation, manufacturing, medical and tourism industry. Macon is a popular tourist destination, which often referred to as the “Heart of Georgia” and the “Cherry Blossom Capital of the World” and has varied cultures, cultural venues, amazing entertainment, prospered arts, and picturesque attractions. 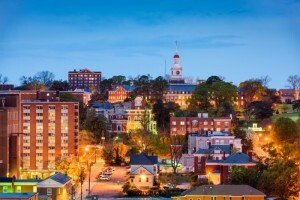 Being a home to 10 historic districts, which has more than 5,500 historic structures and buildings, Macon has such tourist attractions as the Georgia Sports Hall of Fame, the Georgia Music Hall of Fame, the Hay House, the Museum of Arts & Sciences, Sidney Lanier Cottage, the Terminal Station, and the Fort Hawkins. Having rich cultural heritage and wonderful history, Macon has something to offer to its tourists worldwide. The city is served by 2 major airports – Middle Georgia Regional Airport (MCN) and Macon Downtown Airport (MAC), which provide private charter services to leisure and business travelers from all parts of the world.